Details of the events and people that led to the start of Traynor's Folk and Jazz Club. 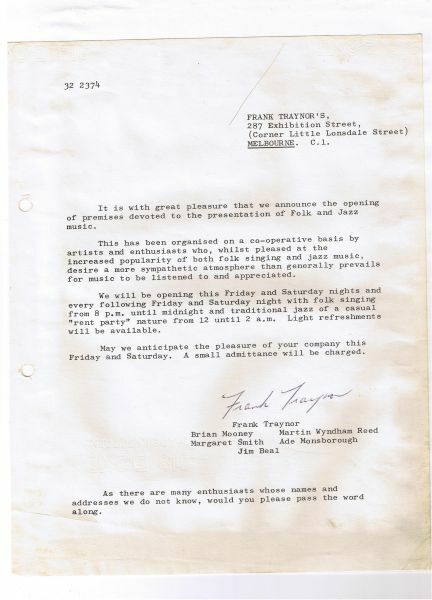 Letter sent by Frank Traynor to other musicians about the opening night. Copyright 2018 The Contributing Editors All Rights Reserved, by the Contributing Authors. Cite/attribute Resource. Traynor, M. (2007, March 02). How it Started. Retrieved April 21, 2019, from Traynors Web site: http://franktraynors.net.au/the-beginning-of-traynors-1. This work is licensed under a Creative Commons License.